On Wednesday 27th June, the Maths department held its annual Primary Maths Mash Up. Top mathematicians in Year 5 from Kingsbury Green, Roe Green, Oliver Goldsmith and St Robert Southwell Catholic Primary were invited to Kingsbury High School to work on various mathematical challenges. They were put into 5 teams, each named after a notable mathematician; Fibonacci, Einstein, Newton, Pascal and Pythagoras and led by Year 12 mathematics students. The year 5 students competed in 4 rounds which put to test their ability to think logically to solve worded problems and complete puzzles such as Cross Number. They impressed both the teachers and sixth formers with their quick thinking and mathematical ability, with many of the Year 12 leaders claiming “These Year 5s are better in maths than I am!”. After an intense 4 hours of mathematical problem solving, team Pascal scored the highest in all four rounds and were announced as the winners. 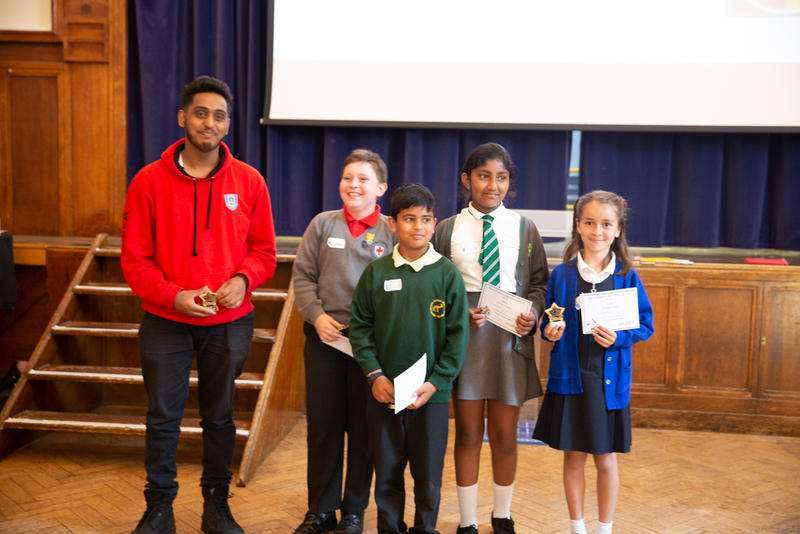 The winners Adeline (Oliver Goldsmith), Colin (Robert Southwell Primary), Mael (Kingsbury Green) and Minisha (Roe Green) were awarded with the Primary Maths Mash Up trophies, KHS Maths badges and certificates handed out by Mr Waxman. Year 13 ended their time in Sixth Form with some special ‘awards’ presented in the study room. There was much laughter and both staff and students had a wonderful time. The event was followed by a social for year 13 complete with an amazing curry, fabulous live music (including Mr Waxman singing) and a bouncy castle. Good luck with exams and see you all on 2 July for the proper Awards Evening.